The 2014 national 50 mile TT was held near Poole on the P418 course, and was organised by Bournemouth Jubilee Wheelers. The National 50 mile TT championship was one of my targets for this summer. Last year I finished 9th in a time of 1.49. This year it seemed to come around pretty quick. The 50 mile champs used to be later in the year, but now has been moved forward to early June. I’ve only done two 50s this year – The Circuit of the Dales and The Charlotteville CC 50 a month ago. The Charlotteville was run in near gale conditions, and I scraped a 1.54 – not that much faster than the Circuit of the Dales! Since then I’ve done a lot of training, and one 100 mile TT, which went quite well. But, I wasn’t too sure of the form I would have. Usually I get faster as the summer progresses, usually peaking in July (for TTs). The course was mainly single carriageway with some dual carriageway. There were quite a lot of roundabouts and I spent yesterday watching a youtube video and trying to memorise the course. As it happened, it wasn’t really necessary. Even if you ‘learn’ the course – when you ride you’re never sure anyway. Fortunately, it was very well sign posted and marshalled by the promoting club and other clubs from South D.C. When there are many roundabouts you worry you might get held up – a problem for any course. But, I didn’t have any problem today and sailed through them all. There was also a patch of newly laid chippings. But, fortunately they had been bedded in, and it didn’t seem much slower than elsewhere. A 7.40 start meant an early rise from Oxford. By the time I arrived in Poole I felt more like sleeping in the car, than doing a 50 mile TT. But, once I got on the bike, I felt fine. For a change, the weather was excellent – warm and light wind. The first 20 miles were hard. It was slight headwind and a surprising amount of climbing – nothing steep, but plenty of long drags. By 20 miles, I was averaging about 295 watts – well over average for my last 50. My 25 time looked a bit disappointing 55.21. But, the last 25 miles were faster – seemed to be a tailwind and a bit of downhill. I was enjoying the race because it was an interesting circuit with lots of drags and I felt in good shape.. Unlike many ‘testers’ I like hilly courses – firstly I’m a lightweight hill climber, but also I like the big changes of effort – go really hard, then recover a bit. In the last 10 miles, I was surprised that I still felt I had a lot of energy. Usually when I do 50 mile TT, I start well, then fade over the last half. By the last 10 miles, I’m usually grovelling along as the power evaporates. But, today the high mileage in past month seemed to help. I actually increased my power over the last fast 10 miles. By the finish, I realised I might struggle to get all the energy out – in retrospect I might have held too much back in the first more difficult half. Possibly, but it was still nice not to blow up in a 50 for a change. I finished in 1.48.04 (27.8 mph). I thought that might be good enough for 4th or 5th place – which was quite a good prediction. I was a few seconds ahead of Adam Topham at the 25 mile mark (probably because most of the climbing was in the first half). But, in the last half he took a minute out of me. Last week he did the 4th fastest 100 mile TT of all time in 3.28, so he’s on very good form. However, Hutchinson and especially Bottrill were in a class of there own. Bottrill’s 1.40 on that course is simply amazing. 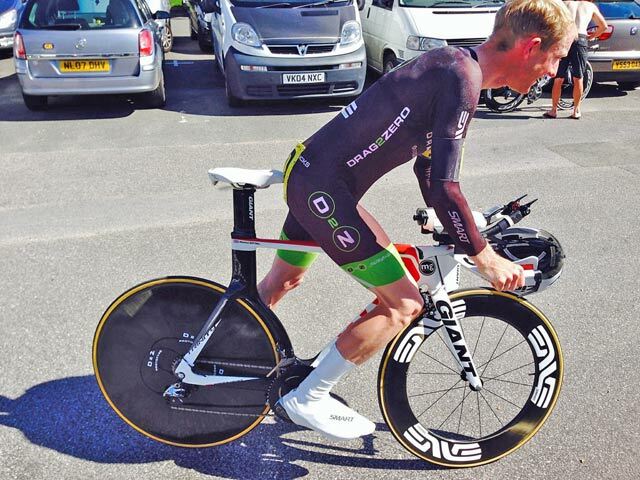 It will be interesting to see how he gets on at the British Time Trial Championship in Wales. On this form, I think he will take quite a few scalps. He may even be quite close to Alex Dowsett, who recently smashed the 10 mile record with a 17.20. I wish him well. After the event it was good to catch up with the great and good of British timetrialling. – such as Richard Spinks of the famous Bristol South CC who finished with a good 13th place. and Matthew Rowley flying the flag for Oxonians CC with a top 30 finish. A common comment from the riders was it was a hilly course – a few riders were saying it’s not a course for an 85kg rider. I kept quiet, not mentioning that if you’re 23 kg lighter – it’s actually a really good course! 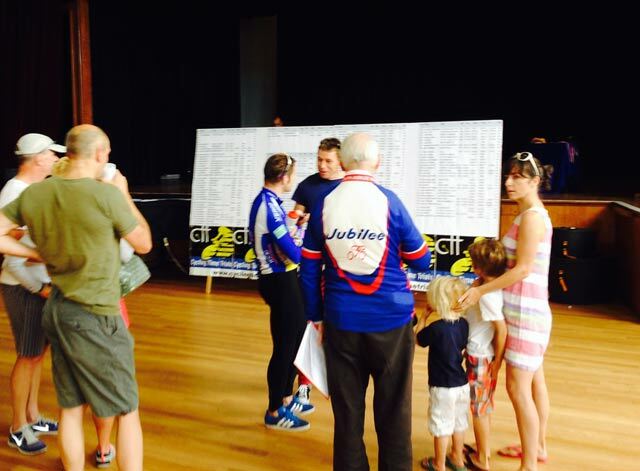 Thanks to Bournemouth Jubilee Wheelers and CTT for putting on a great event. Next year I’ll have to try and find a minute from somewhere. Impressive stuff. Thanks also for sharing power & speed data over 10 mile intervals. Great effort Tejvan. Some top boys riding.